Fine Arts Center Blog: Theodore Waddell's "Abstract Angus"
Theodore Waddell, Motherwell’s Angus, oil on canvas, 1994. From Abstract Angus, now on view at the Denver Art Museum (image source). Currently on view at the Denver Art Museum is Abstract Angus, an exhibition that solely focuses on the work of contemporary artist Theodore Waddell. Abstract Angus features big-scale paintings by Waddell, whose style lives at the crossroads of Minnesotan cattle ranger and modernist heavy paint applications. He is the student of Montana's first modernist painter, Isabelle Johnson. Waddell has been heavily influenced by 19th century European Impressionists and Post-Impressionists -- which is why some of his works have a light, atmospheric quality to them. The DAM's exhibition is meant to challenge the standard conception of art of the American West as realistic. 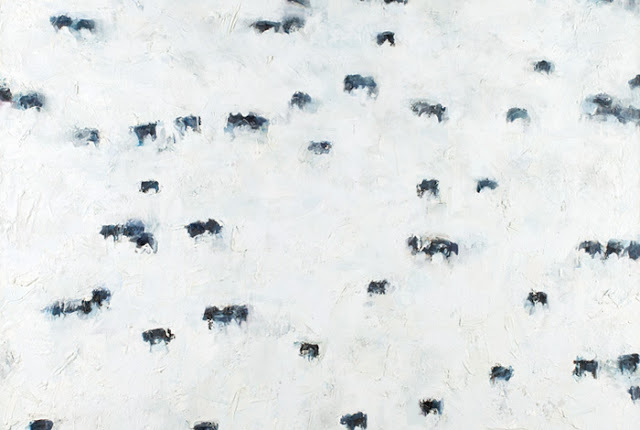 Waddell's abstract style merely suggests a winter landscape, or the procession of the seasons, or a herd of cattle. Theodore Waddell, Sacramento Horses, etching, 1997. On-view now in the first-floor corridor as part of Wild Horses. Waddell has had over 90 solo exhibitions, and one of his etchings is currently on display at the FAC as part of the Wild Horses exhibition. Whiskey for My Men, Beer for My Horses — new date! Fri., August 17 | 6 - 9 p.m.